Creating a marketing strategy can be a tough task, so you may need all the help you can "round" up! Sometimes you can experience a drought of ideas and need help to coral the team to get all the great minds working on a plan. So whether you are starting out on a marketing plan for the first time, or revisiting your strategy to check you have all the right components, we would like to present the Seven P's model - to help you create the right marketing mix. The seven P's model was originally devised by E. Jerome McCarthy and published in 1960 in his book Basic Marketing A Managerial Approach which these thoughts are based on. Same year as the original "The Magnificent Seven" cowboy film which you may have guessed from some of my references above. I have presented a few changes to the seven P’s, mine are: Product, Price, Promotion, Place, Packaging, Positioning and People. There are many different models you can draw on to create or review your existing marketing strategy. Our model is a “pick & mix” approach, where you can use all of the P’s, or mix and match with other factors that may be more specific to your marketplace. Whether you are an advocate of the traditional 4 P’s model or have your own approach to the marketing mix, this is a good place to start to get your ideas flowing. The context of product in today's market is more about a customer looking for a solution to a problem rather than an actual product. At this first stage it is a good time to start looking at your own solution through the eyes of your customers. If you are facing difficulties generating leads and closing sales, it could be that you have lost the trust of your customers, are you really producing what the customer needs? Have you thought through what is it that the customer is addressing with your solution? Have the needs of the customer changed, but you have not? Why does my company/brand exist? Why would customers use you? What is it that your customers are trying to solve by purchasing your product or service? How do you do this better than any other business? Is your product appropriate and suitable for today’s market conditions? To help you define those critical success factors we have a template you can use with examples from our Growth Hacking & Inbound Marketing e-guide. Wants & Needs - a "Buyer's personas"
Invest time developing your own unique buyer's personas. A buyer persona is a semi-fictional representation of your ideal customer based on research and real customer data. Without knowing who your ideal customers are, their backgrounds, goals, pain and how your product or service will benefit them, it’s very difficult to create content to attract leads. Traditional marketers are skilled at understanding traditional products, but the Internet continues to redefine the way we buy, our research behaviour, and how we seek to self-educate and search online. In today's new world order, a traditional approach to product development may leave you lagging behind your competitors. Develop a habit of continually examining and reassessing your price points to make sure they are right for the state of the market and the degree of price sensitivity your customers are showing. Sometimes you may need to adjust your value proposition to take advantage of an opportunity or to react to a competitor or new entrant to your market. Questions tend to come from customers of price, only if they are questioning value – so ask yourself, if you were in your customers shoes what value are you creating? But price is not the best place to lead a charge against aggressive competitors, once you start to reduce price it is a very slippery slope to get prices back-up again. Some times it may be okay to raise your prices under certain conditions, but this needs to be kept in check as a loyal customer does not want to feel that they are being taken advantage of. In some cases it can be a strategic approach that by raising prices you reduce the pool of customers prepared to pay at a certain price point but the reduction in production costs and an increased price for those products that you do sell provides an improved return. Just remember that if you are facing resistance to certain points in your marketing plan be open to revisiting them. Pricing I find is always a sensitive subject because we are always worried about the potential loss of business by rising prices – we are more likely to drop than increase them. But if you are new in a market or in a new segment may be you need to be competitive to remain and thrive. Promotion used to be all the ways you ”tell” your customers about your products and then sell to them. The Internet has facilitated a big change in buyer behaviour shifting power away from the seller - which means that we need to focus more on education not just promotion. The Internet, recommendations and access to a mountain of reviews and insights on social media, has fuelled this fundamental shift in buying behaviour. The sales process for the technology industry for example is complicated and difficult to control, similar to many other businesses that have a complex sales process. And with the increase in the numbers of B2B buyers “self researching”, it is important that your business is being found amongst the huge amount of online content that buyers use in their decision making process. As buyers we are always moving between different stages of the buying cycle, so using a "one size fits all" traditional approach to communication in ineffective. The buyer has so many fragmented ways to research, reach and consume information that you need to take into account the buyer’s digital behaviour and habits. As a result companies are now gradually understanding that they need to shift away from the traditional marketing "push" methodology, and focus on attracting or "pulling" visitors to their website with content marketing to educate and engage through inbound marketing & sales. The next P in the marketing mix is Place or the distribution channels that your customers use to access and buy your product or service. You can sell your product in many different places. It is important for you to understand how the customer finds you, what channels you attribute to generating leads and the various customer touch points. 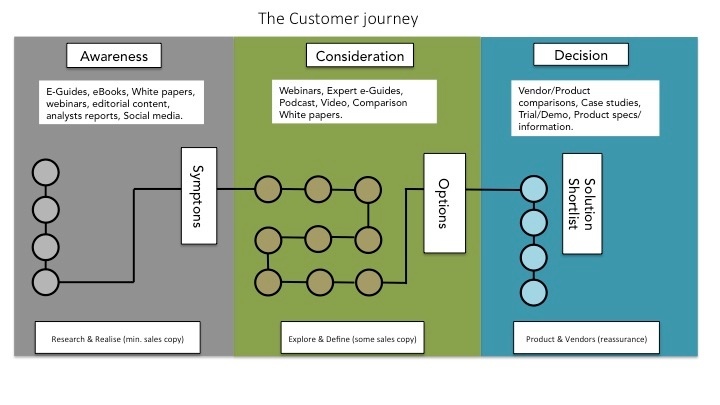 The customer journey can be divided up into three different stages; Awareness, Consideration and Decision when the customer finally makes a purchase. The chart below summarises types of content a buyer would potentially digest as they pass through each stage of the journey. For example, maybe they are at the beginning and need to be aware only that they have an issue that needs to be addressed rather than your company trying to sell a solution too early. Questions to consider in your planning are: Where do you have most interaction with customers, is there a particular order to your customer's journey, and any particular touch point that you could influence? You will need to know where customers are accessing essential buying information. Packaging can be thought of as looking through the eyes of your customer at all the visual elements that represent your service or product. People always ”judge the book by the cover” so a first impression lasts. On a website you typically have only 3 seconds to grab the attention of a visitor or they will leave. In terms of packaging to me it is everything that the customer sees from the first moment of contact with your company all the way through to the purchase. It can also refer to your people, not just the external packaging it is also represented by your company culture, your offices, marketing material, customer service – every single visual element about your company where there is some form of user experience. Why would a customer buy from you? Is your company thought of as a trusted advisor or for its pressured selling? The look and feel must be an extension to be consistent of how your brand is represented across other customer touch points for example your website, emails, etc. How is your business and it's brand perceived in the hearts and minds of your customers and staff? How do you think people reference your brand or their interactions with you? What is your brand positioning and what are you known for? Have you defined your value proposition? Companies need to create a meaningful voice through content creation, establishing themselves on particular channels that matter to their customers and, most importantly, tracking responses and interactions to those efforts. Branding in the inbound marketing age means branding on the Internet, social media and across multiple digital channels - a fast moving environment. The most important thing is to brand the experience that customers have and that should be consistent across all your customer touch points and be instantly recognisable as your company's brand. A positive habit to develop is to ponder about the qualities and impact of the people you employ who have an integral role in running your business. Its amazing to think of how we go through every aspect of running a business but forget that a business can succeed or fail based on the people inside and out that facilitate it's smooth running. Do you have a succession plan, are you employing people too similar to you, are you looking further than apptitude and reading an attitude? People are the most important element particularly of a service business, they have an important role in delivery, customer relationships and the overall customer experience. The people that you employ are a reflection of your business, it's culture and way of working. Inbound is actually a great way of attracting talent, as fans find you from the the good things customers say. And with the relentless 24/7 digital world that we now live in, make sure you are able to respond and react to what is being said about you to protect your brand and people. So don't forget the Seven P’s, mine are: Product, Price, Promotion, Place, Packaging, Positioning and People. May be you have some more to add? To help you get started we have created some fully customisable Marketing Planning & Strategy templates in PowerPoint. You can spend your time now on being creative with our inspiration and less time on putting together slides.